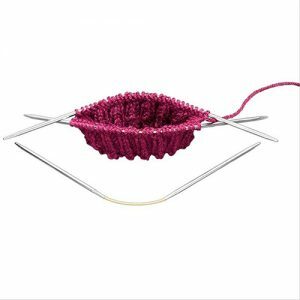 With this 3-piece set of flexible double-pointed knitting needles from Addi, you can knit even the smallest diameters without getting tired. This is possible due to the particular bendiness of the middle part, and the combination of one BASIC – and one LACE tip. Each tip is 85 mm long connected by a 40mm rope. When knitting in rounds, the stitches are distributed over two needles and the third needle is used for easy knitting – meaning only two needle changes per row. Due to the flexible middle part, the needle fits into any hand, and so ensures a very pleasant knitting experience. They can also be used as cable pattern needles. The needles not only make it easier and quicker to knit socks but mittens and baby clothes. This product is protected by a German Federal Utility Patent.